Kitesurfing is one of the fastest developing and growing sports. With more access to the information and new technologies, the research and development teams of all the leading kitesurfing brands are putting the biggest effort in developing the best products. The new kitesurfing gear is more durable, safer and tailored specifically for the individual needs. The individual needs vary depending on the conditions you use your equipment in, level and the style of riding, but also depend on whether you are a male or female. Kitesurfing started as and remained for years a male dominated the extreme sport, but this trend starts to change rapidly. The last few seasons the number of kitesurfing women not just increased, but almost matched the number of kitesurfing men. With this in mind, the leading kitesurfing brands stepped forward to accommodate the needs of female kitesurfers by releasing a variety of women specific kitesurfing equipment. Kitesurfing girls no longer have to suffer back pains from badly fitting male harness or ride too big kiteboard. 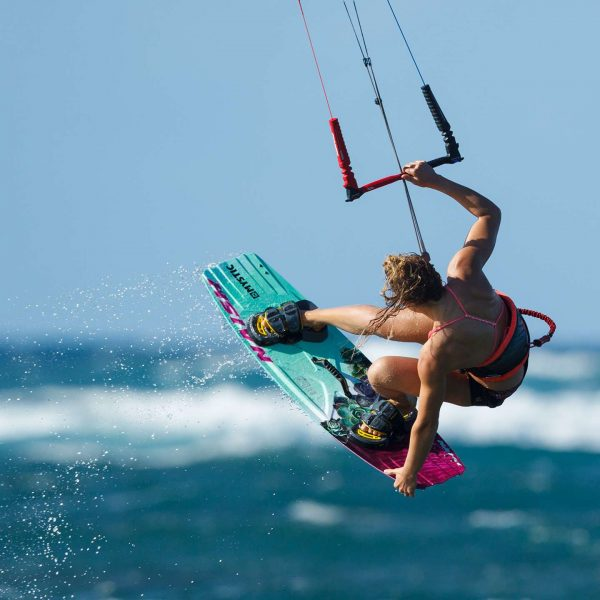 The choice of new kitesurfing gear for women is getting bigger year by year. But do girls really need their own kite gear? There is more in the design difference than just the colour scheme variation in women’s’ collections. Those differences are analysed and integrated into the designs to improve the comfort, performance and safety of the kitesurfing experience. A most obvious piece of equipment that looks and feels different for men and women is the harness. It is the piece of equipment that stays in close contact with your body for the longest part of the session, so choosing the right one is crucial. The anatomical differences in female and male physique inspired brands like Mystic, Ion, Manera, Airush and Prolimit to introduce a range of harnesses for women. Typically women have wider hips, narrower waist and a shorter torso than men. A harness for a woman moulds into the female shape. It has more of an ‘hour glass’ shape rather than a typical triangle shape featured in men’s harnesses. This provides better back support and reduces the discomfort caused by lover part digging into the hips. Girls’ harnesses are shorter and carve into the lower back. This provides more support and stops the harness from digging in the buttocks as the pressure gets distributed evenly. The badly fitted harness is the most common cause of the lower back pain and can have long lasting effect on the health. Choosing the harness that fits properly will prevent the back injuries and improve the comfort during the session. Although the back support is probably the main benefit of choosing the harness for ladies, let’s not forget about the front of the body. To prevent harnesses from riding up and hurting the breasts, the bespoke women harnesses feature an extra support keeping the hook in place and preventing the harness from riding up too much. Last but not least there is the already mentioned colour scheme. If you are not a fan of butterflies and don’t want a pink harness you can now get beautiful, stylish ladies harness that will match your kite and the board. Next up is the board. Indeed women can use any type of a kiteboard and achieve great results. For light and petite ladies and girls, it is a good idea to choose from the women specific kiteboards. F-one, Airush, Crazy Fly, Naish and Shinn all offer a range of specially designed boards for female kitesurfers. The boards designed for women offer different sizes, often being smaller than those available in the standard collections. If you are a shorter woman a smaller board will be easier to maneuver and control. The pads and straps provided with the board will be the right size and the distance between them will allow the perfect stance. Women may have narrower stances due to shorter legs, so the position of the pads can make a big difference in the comfort and performance. A Proper stance will prevent knee injuries and improve your pop. Kite bar, like the harness and the pads and straps, is another piece of equipment we are constantly in contact with during kitesurfing, therefore it largely affects the quality of the session. In most cases, women have shorter arms than men. Sometimes, although not always, the standard kite bars are tested by and developed for male riders with longer arms. 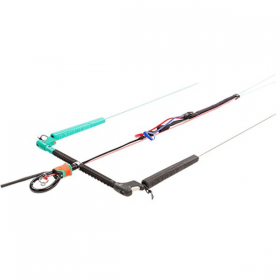 Couple kite brands, including Airush Diamond bar, introduced ladies specific kite bar. Typically the throw of the woman specific kite bar will be shorter which means the depower mechanism sits lower and more accessible. It makes it easy to reach the bar and the depower system in the strong and gusty wind conditions. This also allows the female rider to push the hips forward further without compromising the power delivery, ultimately leading to better riding position and less back pain. The shaft of the female kite bar may be slightly narrower allowing a better grip for the smaller female hands. Similar to the board the choice of kites for women is just as big as for men as kites are mostly the same for both. Brands like Cabrinha, Naish and Airush launched ladies kites. Kites for women usually are very similar or the same in terms of the technical design, to the standard collections. The most obvious difference will be the look of the kite. Lady kites feature more ‘feminine’ designs including different colour ranges and patterns like leaves and flowers that can match your board choice. What about ‘One size fits all’? Most of the kitesurfing equipment is universal and will be both safe and enjoyable to use by both men and women. The choice of gear is very subjective and hugely depends on your body anatomy and personal preferences. Some girls will only ride with the men’s harness and big board and some brands will not even distinguish between the male and female designs as their products are tested and developed for both sexes. Apart from kites being universal in this sense, a good example is a range of Ride Engine harnesses which are great for both male and female riders. When buying a new kitesurfing equipment try to research new releases, test the gear your friends ride and ask an expert for an opinion to make sure you will feel safe and comfortable on the water.